Quo Vadis: A Narrative of the Time of Nero. Amazon.com description: Product Description: Quo Vadis tells of a love between a young Christian woman and Marcus Vinicius, a Roman patrician. It takes place in the city of Rome under the rule of emperor Nero around AD 64. About: Quo Vadis tells of a love between a young Christian woman and Marcus Vinicius, a Roman patrician. About: During the tumultuous reign of Nero, Vinicius, a pagan, and Lygia, a Christian, fall in love. About: From the Translatorâs INTRODUCTORY : IN the trilogy "With Fire and Sword," "The Deluge," and "Pan Michael," Sienkiewicz has given pictures of a great and decisive epoch in modern history. About: Henryk Adam Aleksander Pius Sienkiewicz; also known as "Litwos" (1846-1916), was a Polish journalist and Nobel Prize-winning novelist. 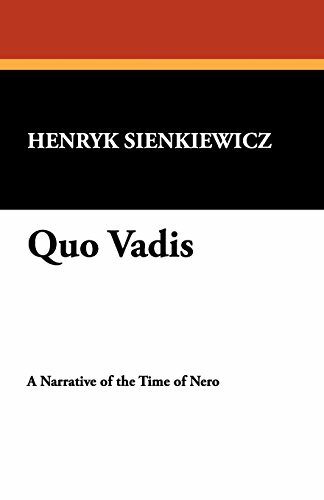 With Henryk Sienkiewicz | from Wildside Pr (May 30, 2008); titled "Quo Vadis: A Narrative of the Time of Nero." About: "Quo Vadis: a Narrative of the Time of Nero" is the story of a love that develops between a young Christian woman, Lygia, and Marcus Vinicius, a Roman patrician.